Captain Byron Anthony Wiley, USN (Ret. ), passed away on Sunday, November 27, 2011 after a prolonged struggle with Progressive Supranuclear Palsy. Born in Pine Bluff, Arkansas, on June 29, 1931, Capt. Wiley proved to be an avid student, leader, world traveler and advocate for equality in, and access to, higher education. Capt. Wiley obtained a baccalaureate degree from Creighton University and Master’s degrees from Drake University and the University of Southern California. He was also an alumnus of the National Defense University and Harvard University‘s Senior Executives in State and Local Government Program. During his thirty-year career as a U.S. Naval Flight Officer, Capt. Wiley was designated a “proven specialist” in human resource management and military intelligence. 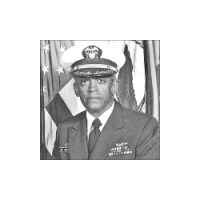 He spent time in service in England’s Royal Navy as part of the Military Personnel Exchange Program, and was the first African American in the history of the U.S. Navy to serve as personal aide to an admiral. Following his time in the Navy, Capt. Wiley served in consultant and assistant positions at several distinguished institutions, including the Johns Hopkins University, the University of California-Santa Barbara (where he served as Vice Chancellor) and Pennsylvania State University. Capt. Wiley was eventually appointed as the System Director of Social Equity for Pennsylvania’s State System of Higher Education, where he served for ten years. It was at Clemson University where Capt. Wiley realized one of his greatest accomplishments: the creation of the Emerging Scholars Program, a college outreach effort that targets high school students in economically depressed areas of the state. Since 2002, the Emerging Scholars Program has made higher education a reality for students who have not seen college in their future. To date, more than 150 students have completed this program and more than 100 are currently in training. Over 90% of the students who complete the program apply to and attend college their first year out of high school. Capt. Wiley is survived by his wife, Carol Ann; his son, Alex; and daughters, Celeste, Adrienne, and Joanna. A Rosary Vigil will be held at 7 PM, Thursday in St. Andrew’s Catholic Chapel. The Funeral Mass will be celebrated at 11 AM, Friday at St. Andrew’s Catholic Church with Father Gregory West presiding. Condolences may be expressed online at www.robinsonfuneralhomes.com or at Duckett-Robinson Funeral Home, Central.